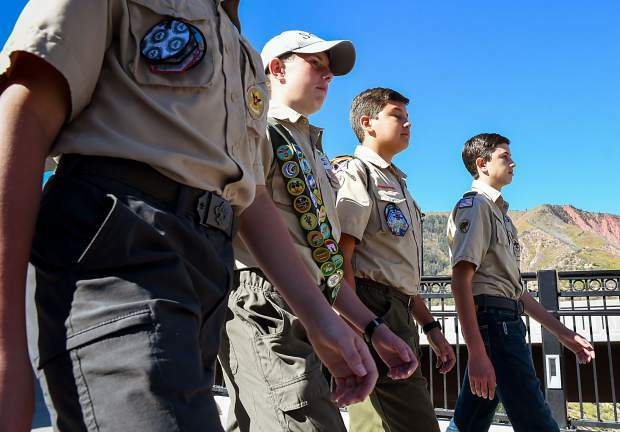 Members of Boy Scout Troop 225 lead the parade across the Grand Avenue pedestrian bridge during Saturday's Big Birthday Bash at the Hotel Colorado. Ute tribal member Kenny Frost gives an opening speech and blessing at the Hotel Colorado's Big Birthday Bash on Saturday morning. 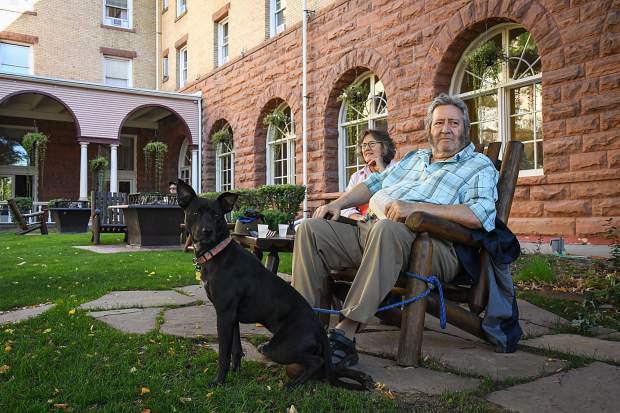 Glenwood Springs residents Victoria and Eddy Monge sit in the Hotel Colorado courtyard with their dog Jemma during the Big BIrthday Bash on Saturday morning. Scenes from the Big Birthday Bash celebrating the Hotel Colorado on Saturday morning. 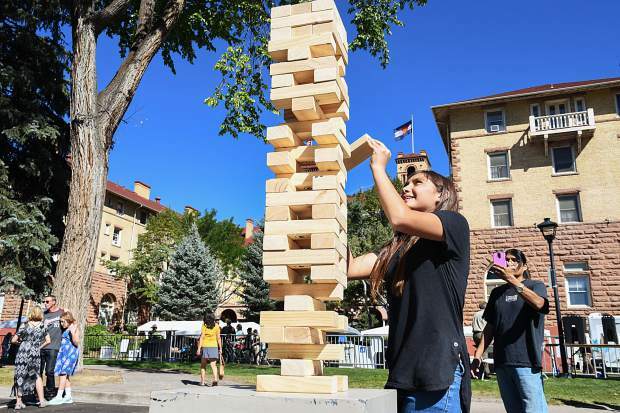 13-year-old Ana McCook tries to keep a steady hand while playing a game of giant jenga at the Hotel Colorado's Big Birthday Bash on Saturday morning. 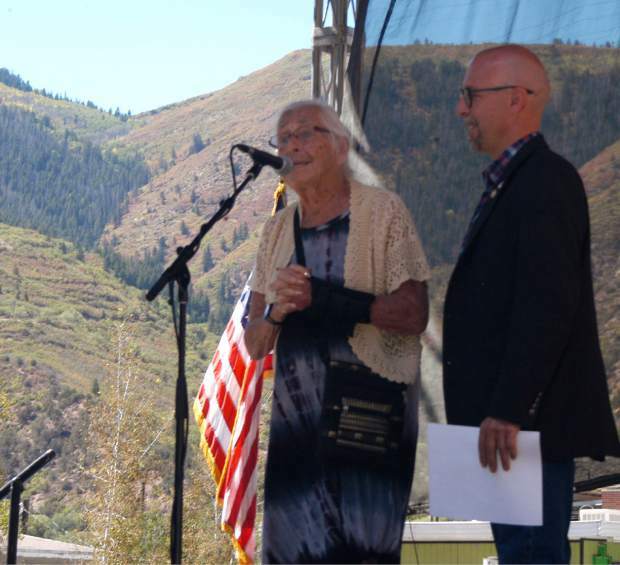 Marian Melville and her son Craig Melville speak Saturday about the family's commitment to maintain the legacy of the historic Hotel Colorado, during the combined 125th birthday party for the hotel and the nearby Yampah Spa and Vapor Caves. 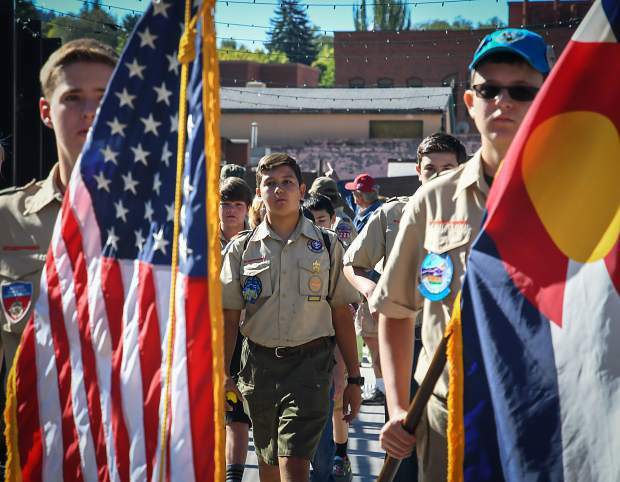 Members of Boy Scout Troop 225 lead the parade across the Grand Avenue pedestrian bridge during Saturday's 125th Big Birthday Bash at the Hotel Colorado. 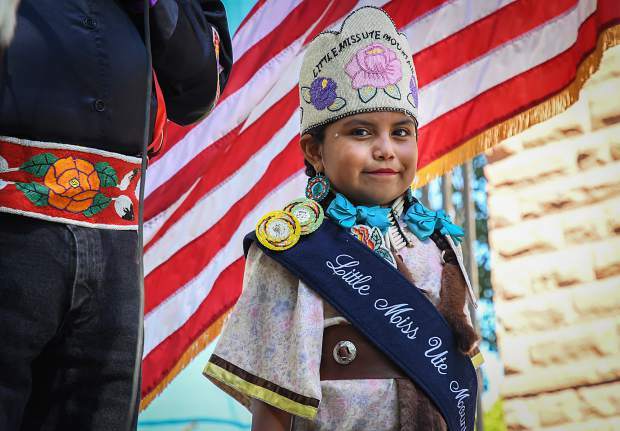 Little Miss Ute Mountain Riley Lang stands with her grandpa as he gives the blessing at the start of the Hotel Colorado's Big Birthday Bash on Saturday morning. 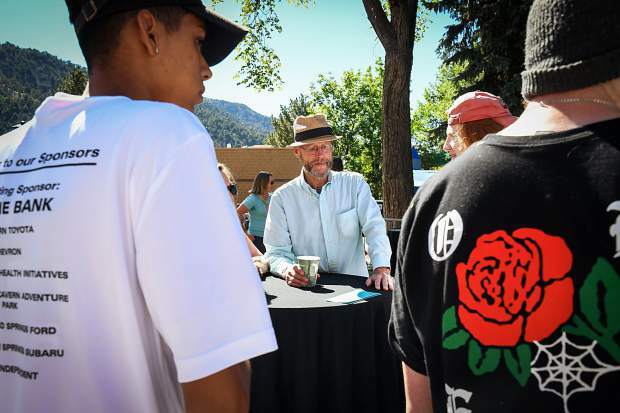 The smell of pancakes and syrup wafted through downtown Glenwood Springs on Saturday morning as the Hotel Colorado and Yampah Spa and Vapor Caves Big Birthday Bash started with a breakfast under the Grand Avenue Bridge. Music filled the crisp morning air as community members enjoyed breakfast and an idle chat before the big festivities began with a walk across the pedestrian bridge to Sixth Street in front of the Hotel Colorado. 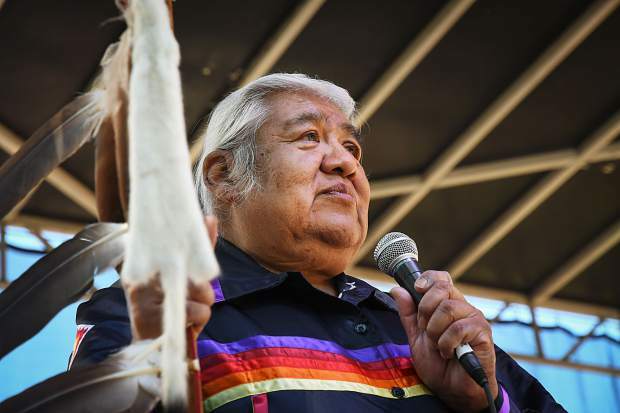 After the presenting of the colors by the Boy Scouts, Ute Indian tribe elder Kenny Frost from Bayfield gave the opening blessing. 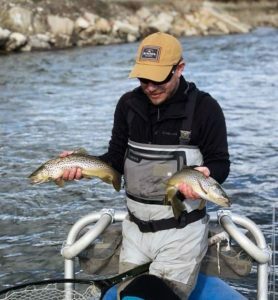 “The hot springs, caves and all the land that surrounds here are sacred to the Utes, so it is always good to come back here. 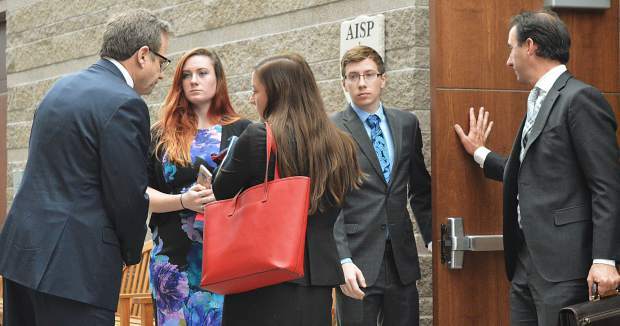 Playing an important role in this event is special,” Frost said. 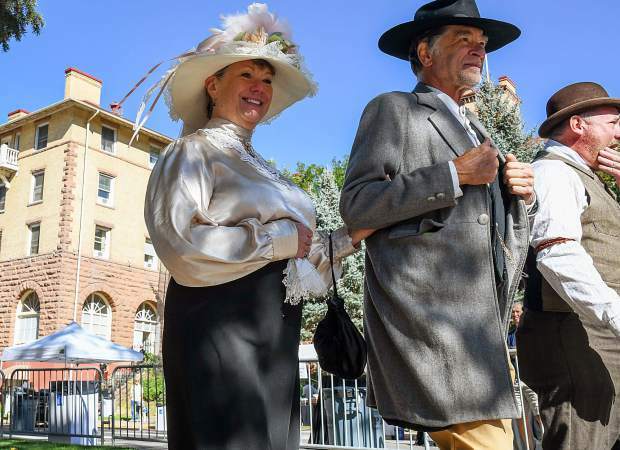 Children flocked to the family-friendly event, as laughter and screams of joy echoed off the brick and sandstone walls of the historic Hotel Colorado. “It’s awesome that they are celebrating it with the community,” Parachute resident Linda Ramirez said. Ramirez and her husband brought their son to enjoy the kids entertainment and activities. “I didn’t realize it was that old,” Benjamin Ramirez said. In conjunction with the event Hotel Colorado unveiled plans for some renovations that will be coming to the historic Glenwood Springs hotel, which is on the National Register of Historic Places. The Melville family of Aspen, the new owners of the hotel, has hired the same architects that did the Crawford Hotel and Union Station in Denver. Marian Melville, the matriarch of the family, spoke during the afternoon presentation of dignitaries of her husband Ralph Melville’s passion for hospitality. 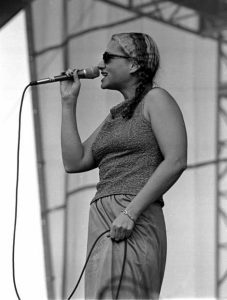 “Here’s the end of it right now, the Hotel Colorado,” she said, pointing to the hotel known as the “Grand Dame” of Glenwood Springs. 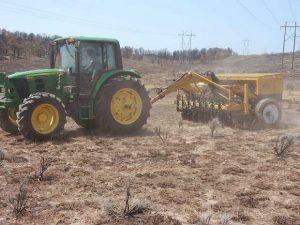 Her youngest son, Craig Melville, spoke to the importance of stewardship, rather than ownership, when it comes to a historic piece of property. 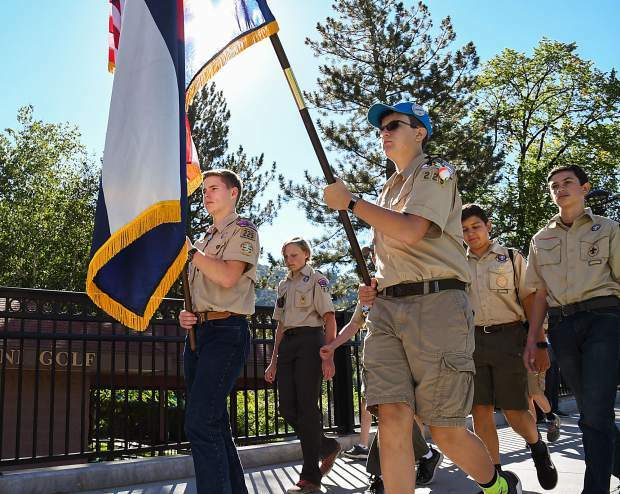 Glenwood Springs Historical Society tours of the hotel, the city’s old hydroelectric power plant and Vapor Caves — all designed in the late 1800s by architect Walter Devereux — gave the community an up-close look at the history being celebrated. “This is huge, 125 years is a tremendous accomplishment,” New Castle resident Roberto Moreno said. A steady cascade of people flowed through Sixth Street on Saturday in Glenwood, walking and biking to the event. 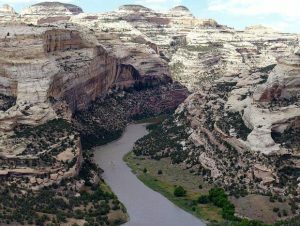 Martin and Lori Kollman and their two children biked into town from their home at No Name, just east of Glenwood Springs on the Colorado River.